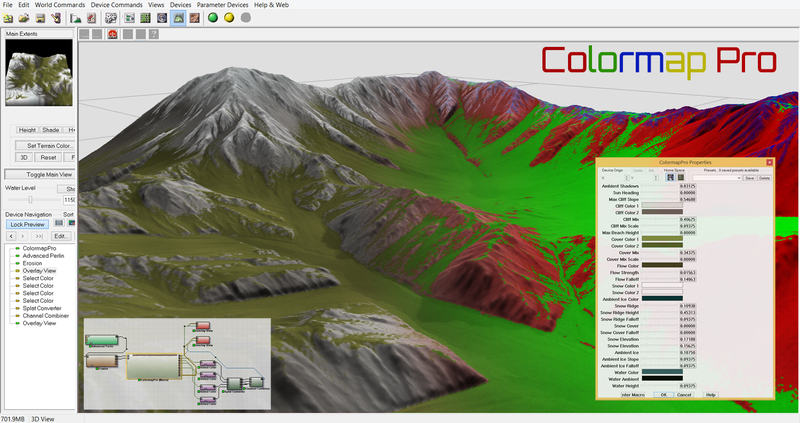 Two required inputs; height map and flow map (both available with natural erosion). ColormapPro is a heavily modified version of the coastal overlay macro built by Nico Korn. Each dual color has mix perlin capabilities. I've also extended out a lot of fine controls for snow, clifs, cover and water. Bitmap and heightmap outputs available over all areas as well as a optional normal map output. Please note you can convert the bitmap outputs to heights for spatmap converting by using a color selector set to white as see in the sceenshot. devin@devinrolsen.com if you have any questions. I got this working using Build 3020. The easiest fix is to change the macro output type for the Lightmap from a Bitmap to a Heightfield. Not sure that is the appropriate step to take for the lightmap but at least all the output files were created. 3.0 Dev 3, also NO output! Has this been tested on 3.0.dev3? For some reason I'm getting no output. Further testing reveals that Snow 2 is appearing on flat terrain. Great Macro. I'm having some issues with Snow 2 appearing outside the bounds of where it should normally appear ... mostly appearing as banding in lower altitudes.